And suddenly I was in Auckland, New Zealand. With a family funeral on the other side of the world I managed to attain some free time to complete two paintings at the North Shore residence. Leaving the heat of the UK, the coolness was welcomed, and apart from some mistiness and then rain on the final day skies were clear. First job was to take a trip to “Warehouse Stationary” to select a couple of canvases and a selection of my normal paints. I could never have imagined when I first started with these paints in 2010 how hard they would be to obtain in the UK and how easy on the other side of the world. Well they are made in Australia, which probably explains it. Canvases were basically chosen on a what might fit in the suitcase basis. I chose to sit on “the deck” which is like a glass conservatory on top of a carport with views down to the sea. Now there’s a limit to choices of view from here but I felt I couldn’t guarantee what the winter weather might do and so this covered environment felt the safest bet. 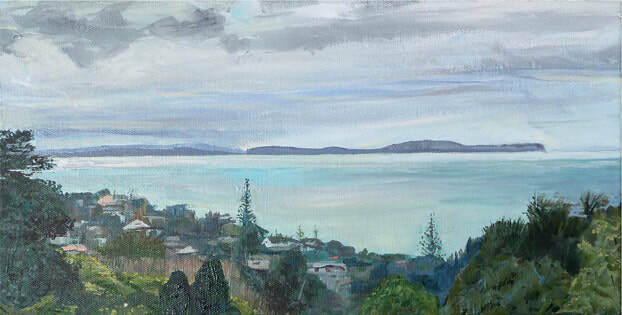 Now I’d painted the “key view” before (See painting 29 “View from the Deck Auckland, New Zealand” and wondered what would be a different take on this. I chose to look past the neighbor’s house completely even though I find it interesting and concentrate on the natural environment. As with any live paintings the sun would move round and the sea would change. So I chose an average of the view. During the process of painting this picture I discovered that it was the shortest day in New Zealand. I liked that concept of winter in late June and so used it for the title. So rather than overtly say I was on the other side of the world, I thought this title would add some mystery.